Stockertown Auto Services - Dave's Automotive LLC. Since 1972 Dave's Automotive LLC. has been providing the Stockertown, Nazareth, Easton and surrounding areas with only the highest quality of automotive service available. Our number one priority is to make our customers feel confident that not only was their car maintained and repaired by only the best technicians with many years of combined experience and with the utmost respect for your vehicle, but that, YOU, the customer were treated with respect. We provide this superior service through very open communication about what your vehicles needs are at the time you are in and how to forecast what you may be needing down the road to help YOU budget for the foreseeable expenses such as brakes, tires and timing belts. When those unpredictable breakdowns happen you can be assured that your car will be properly diagnosed and a complete and understandable explanation given to you as to what your vehicle requires for repair. We are a full service maintenance and repair facility that is capable of working on all makes and models, foreign and domestic. We are here to serve YOU! 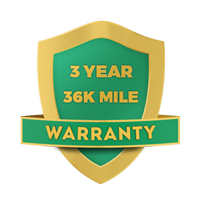 We provide a Nationwide 3 year/36,000 mile warranty on parts and labor!